For the one hundred or so high school student participants, Friday the 13th wasn’t a day filled with ominous thoughts or superstitions, but one laden with deep thought, excitement and accomplishment. 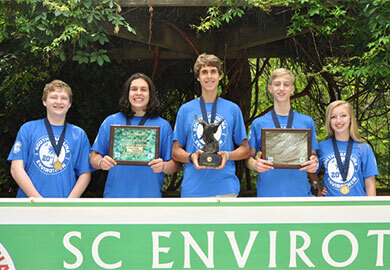 The 20th annual S.C. Envirothon competition was held May 13 at the Sandhill Research and Education Center in northeast Columbia. High school students from around the state began their competition journey before day-break, loading vans and buses to attend, vying for the coveted reward of scholarship funds and a paid trip to Ontario, Canada. After completing college-level exams in Aquatics, Forestry, Soils, Wildlife and Invasive Species, and presenting an argument based on a given scenario for the Oral Presentation station, teams of five ate lunch and awaited their fate while exam graders and orals judges calculated final scores. When it was all said and done, Spartanburg High's Team B was announced as the Third Place finisher, Spartanburg Day School Team A followed with Second Place, and Spartanburg High's Team A took top honors, finishing in First Place. Each student on a winning team received a scholarship award valid for five years. In July, the North American Envirothon will be held in Ontario, Canada, at Trent University in Peterborough where winning teams from over 40 states and nine Canadian provinces will compete. 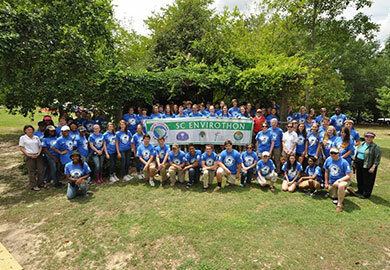 Having provided more than $87,000 in college scholarships to Envirothon students over the 20 years, the S.C. Envirothon is proud of what it has accomplished. Kellee Melton, chair of the Steering Committee, said, "As a student, your participation in today's event is preparing you to take on a leadership role which will shape the future of natural resources and the health of our environment. You will be the innovators who encourage others to be good stewards of the land. Your dedication and desire to be a part of South Carolina’s Envirothon is a clear indication that you are poised to be a future leader." With a mission to advance environmental awareness through an outdoor venue for high school students, to assess their knowledge of natural resource management issues, and to promote a life-long commitment to environmental stewardship, the S.C. Envirothon is nothing without the coaches who participate and motivate their students to attend, and the students themselves who go beyond the given materials to research topics, study the materials, and work together to achieve those top scores. All of the participants in the 2016 SC Envirothon are commended for their efforts. The S.C. Envirothon is coordinated by the S.C. Department of Natural Resources in cooperation with the S.C. Forestry Commission, U.S. Department of Agriculture-Natural Resources Conservation Service, Central Carolina Technical College, Francis Marion University, Florence County Environmental Discovery Center, S.C. Soil and Water Society and Clemson University Sandhills Center. Major financial sponsors are the S.C. Conservation Districts Foundation, Harry Hampton Memorial Wildlife Fund, S.C. Association of Conservation Districts, and S.C. Forestry Foundation. If you would like to become a sponsor, or if you wish to follow the successes of the S.C. Envirothon, visit the website at www.dnr.sc.gov/education/Envirothon , contact the S.C. Envirothon coordinator, Marc Cribb, by telephone at (803)734-6367, or like us on Facebook at www.facebook/SCEnvirothon.